Workflow process. In simple terms, it’s all of the actions needed to turn raw material into a finished / sellable product. But is there only one way to create a finished / sellable product? No, of course not. There are always different ways to obtain the design goal. I like to use this analogy. How many different methods can be used turn a wet sponge and into a dry sponge? You can squeeze it. You can dry it in an oven. You can spin it dry with centrifugal force. You can just let it sit out and let the water evaporate. You can also change the variables of these methods to change how effective they are. Pressure, time, temperature, RPM can all be modified to speed up or slow down the water removal process. All of these methods will get you to the same desired goal. But…which method (and variables) will get you there in the most efficient way? This is the same challenge that faces manufacturers every day. Building the product more efficiently than your competition allows you to be in control of the market instead of always playing catch up. Ideally, I want my competitors to wonder how I can produce that product at that price and still be profitable. An efficient workflow process is a key component of profitability. 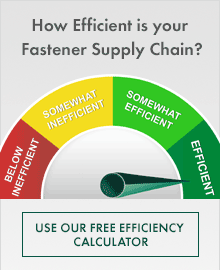 But you may ask yourself, “How can I identify opportunities to improve efficiency and reduce costs?” Who understands the various workflow methods (and variables) as it relates to fastening? Many of us have a full schedule every week and do not have the resources to consistently identify, research, and validate cost savings ideas. Right or wrong, it’s just not the true number one priority for many organizations. But how valuable would you be to your company if you were a key contributor of cost savings opportunities year after year? Very valuable indeed! There is no such thing as a 100% efficient workflow process. Field engineers have spent thousands of hours working on cost savings projects for our customers. 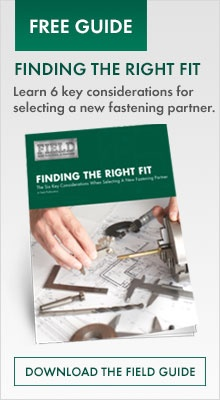 We research and understand the pros and cons of various fastener (and fastening) systems. Utilizing our knowledge from these past projects we can make realistic and achievable cost savings suggestions for your workflow process. We ask questions in order to fully understand the application and all requirements. We work with our customer to develop a testing and validation plan and we become the project manager to get the project implemented. We’ll measure the performance of the current system and the performance of the alternate solutions and provide a formal test report. Field is the industry leader in cost savings through technical support. This is just one of the many ways we bring value to our customers!